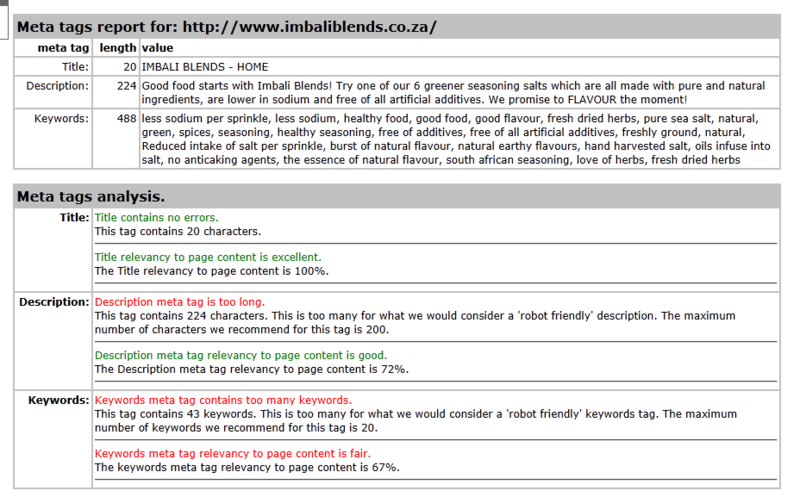 www.imbaliblends.co.za my site i think looks good and is good on content, i however have battled with optimizing my site effectively. The key words do not seem to work. I need someone to tell me how I am doing. 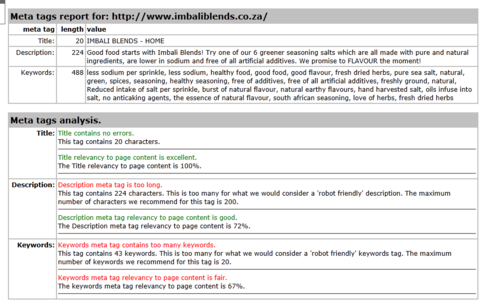 as you can see its quite poor, your title, description and keywords have to be relevant to your page content and as you don't have any content that's going to be difficult. I would consider a re-work of your home page to include some text and then add your meta tags based around that text. Although we'd love to, we do not have the resources to assess website ourselves. We have partnered with WPromote who have their own dedicated and knowledgeable team who will be able to assess your site! You can visit the WPromote Support Page to post any question or request assistance. Thank you i have done what you have said and am working on the home page, i would appreciate your feedback. I'd be quite happy to take a look for you, post back here when you're ready. 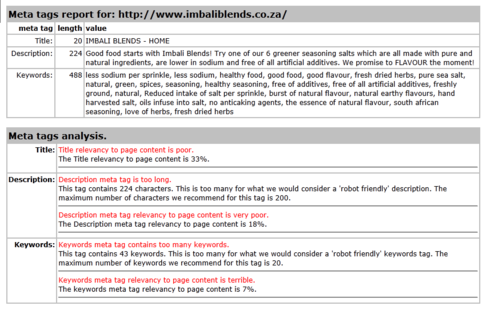 www.imbaliblends.co.za thanks david I am done take a peak..
Its exactly the same Danielle have you published your edits? Thanks for helping out on this thread, David! I cant remember but there was a reason for me doing it this way... not sure why. Yes, there is a way in which to change the index page to a different page. We have a tutorial with the steps here: How can I change my index page to a different homepage? You now seem to have 2 home pages, the first with the auto direct from your site address and the second when you click on home. The index page has to be your home page and is the page google etc will direct your traffic to. I think you may have removed the index page from your navigation, replace it and remove the current home page, you can delete it later when things are sorted. David thanks for all your help i think its working better now... just take a peak.. The like button is the same as this site... on the very bottom of the page. i have done it although it does not show yet. 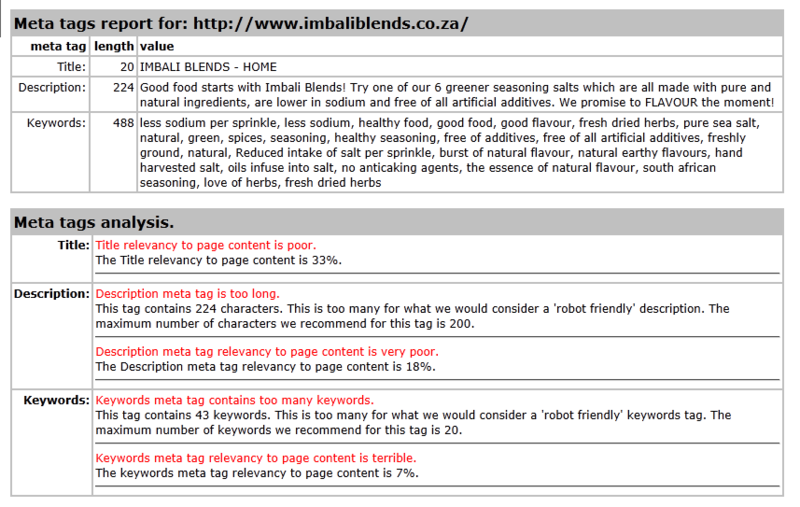 When you consider your keywords think of words or phrases you would input into search engines if you were a potential customer to find products you have on your website, you have as a phrase 'reduced intake of salt per sprinkle', I don't think this is one of the phrases that your customers will type in to hopefully find you. Lastly when you achieve a position you're happy with in google you need to work hard to keep there, check out google adwords to keep up to date with the latest keywords and try to introduce fresh content on your home page on a regular basis. I hope this has helped here is a link to the meta tag analyser I use so you can check your progress, post back if you need any more help or clarification. Thanks David, i am sorted.. Will look into the google adwords.